Products – Cameras – AC-PB5600-BLK – Team Research Inc. 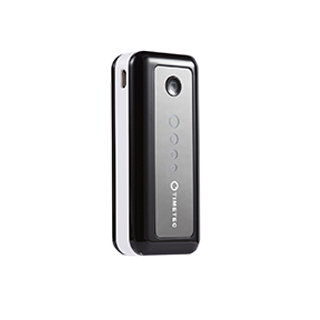 The Timetec Xamp 5600 adds 2.3 times more power for the standard iPhone 4 (with 1420mAh battery). It holds 90% of its charge for up to 30 days, and can sit unused for up to three months without needing to be recharged. Plus, the Samsung Grade A charging cell brings you the highest quality and reliability. This sleek and slim 5600 is compatible with nearly all iPhones, iPads, iPods, Samsung Galaxy phones, Blackberrys, Droids, and Kindles, plus phones and devices from HTC, LG, Motorola, Sony, and more. The Timetec Xamp 5600 comes with a soft travel bag, an AC adapter, two extension charge cables, and five connectors. It even includes a handy, built-in flashlight that can burn all night for almost a month without needing a charge.